Raging battles between Syrian government forces and rebels in the historic districts of central Aleppo have started a major fire that threatens to destroy the city's medieval markets. Reports say hundreds of shops in the souk, one of the best preserved in the Middle East, have been destroyed. The labyrinth of narrow alleys lined with shops was once a major tourist attraction, but has been the scene of near-daily firefights and shelling in recent weeks, after rebels who fought their way into the city two months ago pushed toward its center. Some activists described the overnight blaze as the worst blow yet to a district that helped make the heart of Aleppo, Syria's largest city and commercial hub, a UNESCO world heritage site. The fire started late Friday amid heavy government shelling and was still burning Saturday, activists told The Associated Press. Video posted online showed a pall of smoke hanging over the city. 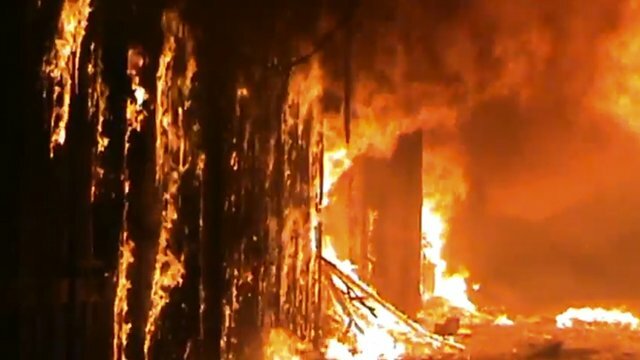 One Aleppo-based activist, Ahmad al-Halabi, estimated the fire destroyed a majority of the shops in the district. "It's a disaster. The fire is threatening to spread to remaining shops," said al-Halabi, speaking to AP from the stricken area by telephone. He claimed Syrian authorities cut the water supply off the city, making it more difficult to put out the fire. He said rebels and civilians were working together to control the fire with a limited number of fire extinguishers. "It is a very difficult and tragic situation there," he said. The souks -- a maze of vaulted passageways with shops that sell everything from foods, fabrics, perfumes, spices and artisan souvenirs -- lie beneath Aleppo's towering citadel where activists say regime troops and snipers have taken up positions. Many of the shops have wooden doors, and clothes, fabrics and leather inside helped spread the fire, activists said. "It's a big loss and a tragedy that the old city has now been affected," Kishore Rao, director of UNESCO's World Heritage Center, told AP. In awarding heritage status, UNESCO said Aleppo's "13th-century citadel, 12th-century Great Mosque and various 17th-century madrasas, palaces, caravanserais and hammams all form part of the city's cohesive, unique urban fabric." The Guardian says Aleppo's souks are not the only Syrian cultural treasures to have fallen victim to the violence following the country's uprising and the crackdown by the Assad regime. Some of the country's most significant sites, including centuries-old fortresses, have been caught in the crossfire in battles between regime forces and rebels. Others have been turned into military bases. In Homs, where up to 7,000 are estimated to have died, historic mosques and souk areas have also been smashed and artifacts stolen. Politics has many rules that are mostly uncivil and unethical. Rules in politics often prioritize interests over humans. The latter are at times sacrificed on account of concern or cowardice. Cuba was at one point the Soviet Union’s Number One ally -- a Communist island nation (just 90 miles) off U.S. shores. Moscow, for Cuba’s sake, risked a nuclear war that could have devastated the world. A while later, America started instigating East Europe against the Soviets. As soon as it felt America’s grip tightening around its neck, Moscow counseled Fidel Castro to stop backing Communist movements in Latin America. Though he fancied painting the whole southern hemisphere red, Castro desisted – not so much to avoid irritating Moscow but for fear of an American-Soviet deal at his expense. Who says Russia won’t close its eyes to an American invasion of Cuba such as America let pass the Soviets’ occupation of Prague? “Today’s Iraq” resembles the “1960s Cuba.” Today’s Iraq has ideological ties with Iran. It also complies with demands from its American ally, who signed away at the White House the State of Law Coalition to the epitome of democracy, Nouri al-Maliki. When Barack Obama’s busy schedule prevented him from flying to Baghdad, Maliki hopped over to Washington to receive the freedom keys. And as soon as he returned to Baghdad, Maliki refocused on reconciling his old crush on Iran with new American constraints. That’s why when America told him Iran should stop using Iraqi airspace to fly arms to Syria, he listened to his head, not his heart – or so it seems. In the Syria war, each has a tie-in. We don’t need to know them all today. We could get to know them after a while or when it is too late. But there is certainly a link-in-the-chain that makes Hilary Clinton talk more like a political analyst from The Times than a secretary of state. There is another tie-in that makes China stand by Russia against Arab states and their Arab League, Europe and the Muslim-world-minus-Iran. In politics, no rule prevents the monitoring of developments on the ground to gauge the power balance instead of to take care of victims. That’s why no one sees the Bombing of Aleppo as akin to the Bombing of Dresden. In 1975, Suleiman Franjieh sent two rusting Hawker Hunter warplanes to bomb Palestinian refugee camps. The outcry in the Arab world saw the fighter-bomber jets hangared again. Each day, loathsome MIGs take to Syria’s skies to pound cities and turn Aleppo neighborhoods into piles of rubble and ash. Meantime, the world at the United Nations still has to listen to the speeches of Sergei Lavrov.